Based on a Joe Lansdale book, Jim Mickle’s Cold in July is an odd, twisty Texan neo-noir that at first seems straightforward and scary but a mite predictable. Michael C. Hall is Richard Dane, a mousy picture-framer in a small Texas town who—in a superbly edited sequence—accidentally shoots a burglar in his house in the middle of the night. Almost immediately, he finds himself the focus of the dead man’s vengeful ex-con father. The film is set in the late 80's and has a score that's heavily influenced by John Carpenter. Set in East Texas, 1989, with exquisite attention to period detail, the film is in many ways a coming-of-age tale for the three adult men at its center. After he kills the burglar who breaks into his family’s home one night, the preternaturally nervous Richard Dane (Michael C. Hall) is consumed with guilt. His near-crippling remorse does nothing, however, to appease the burglar’s hoodlum dad, Russell (Sam Shepard), who wants revenge. A character-driven thriller with more twists than an off-the-map dirt road, awards-quality performances from the three leads, a rare sensitivity to the after-effects of horror and a sure directorial hand. 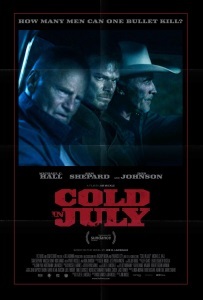 As entertaining as it is to watch Cold In July drift, the film has to eventually pick a lane—and that’s where this otherwise accomplished suspense picture runs into the ditch. Without saying much more, it’s a weird path to forge, from the thorny moral inquiries of act one to the pandering genre thrills of act three. The upshot isn’t just genuinely dumb, it’s a bit tasteless, as though either Lansdale or Mickle let some irresponsible 14-year-old dream up a “badass” ending. Enjoying a long, strange trip doesn’t always mean appreciating the destination.